The publication consists of five components: 1) an essay by Jentery that discusses the relation between the Kits for Cultural History and Fluxkits from the 1960s, ’70s, and ’80s; 2) a slideshow of posters by Victoria and the MLab team that document our process of making the Early Wearables Kit; 3) an “unboxing” video by Danielle and the MLab team that shows how someone might interact with the Wearables Kit; 4) a Github repository by the entire MLab team that contains the Kit’s core files and components (see our previous announcement for the repo); and 5) a brief “about” page describing the project. 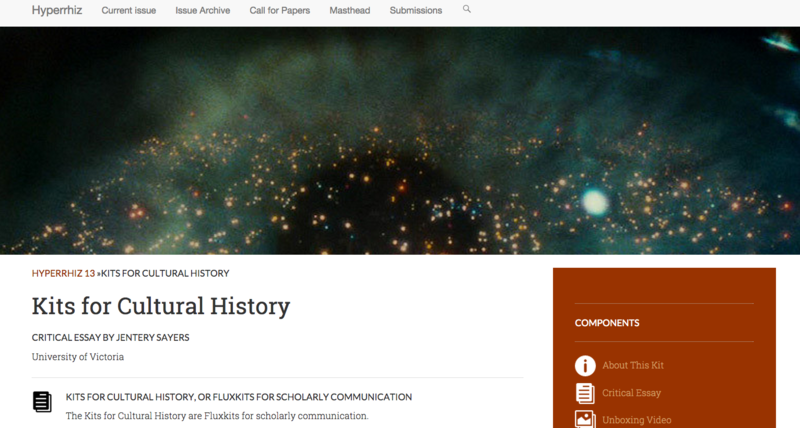 Along with the recent exhibition of the Wearables Kit at Rutgers, the MLab’s appearance in Hyperrhiz demonstrates our multimodal approach to publishing Kits for Cultural History. We hope that this new issue of Hyperrhiz will inspire more, like-minded publishing projects across the arts and humanities. Post by Tiffany Chan, attached to the KitsForCulture project, with the news, exhibits, and fabrication tags. Image care of the Maker Lab and Hyperrhiz.